Science and Parkinson’s: As a scientist (I study how blood clots), I believe that the path to understanding Parkinson’s is through careful and thorough scientific experiments. In my academic career, I’ve read 1000’s of papers, written and published >130 papers/book chapters, and submitted too many research proposals to count. The ‘fuel-of-science’ is the man/woman-hours dedicated to thinking, planning, doing and interpreting scientific experiments. A key to advancing any science idea is the hypothesis (Definition of hypothesis is “a supposition or proposed explanation made on the basis of limited evidence as a starting point for further investigation”). In other words, a hypothesis could be something like ‘does X cause Y and then lead to Z?’ You then design experiments to test your hypothesis. As a scientist with Parkinson’s, in my spare time I follow the scientists committed to understanding the science of Parkinson’s; hopefully, their work will lead to better treatment strategies including curing this disorder. Here is one very new and exciting story about testing a novel hypothesis of Parkinson’s. Hypothesis #1. Mitochrondria dysfunction damages the substantia nigra region to lose dopamine-specific neurons that are characteristic of Parkinson’s (Mitochrondria are organelles found in most cells, they are essential for many biochemical processes of respiration and energy production.). Hypothesis #2. Alpha-synuclein-mediated Lewy body formation damages the substantia nigra region to lose dopamine-specific neurons that are characteristic of Parkinson’s (as described here previously, clumps of the protein alpha-synuclein form Lewy bodies in neurons https://journeywithparkinsons.com/2015/05/23/the-alpha-synuclein-story-in-parkinsons/ ). The diagram below shows the two separate pathways. The chicken or the egg first question asks whether Parkinson’s is simply characterized by these events (that is, mitochrondria dysfunction and alpha-synuclein-mediated-Lewy body formation) or do these events actually promote Parkinson’s? Hypothesis #3. A research group (Univ Pittsburgh) merged together the two hypotheses. Their hypothesis was that alpha-synuclein forming Lewy bodies promotes mitochondria inhibition, which then damages the substantia nigra region to lose dopamine-specific neurons that are characteristic of Parkinson’s (see the green arrow below). Of mice and men: Before we can either slow the progression of Parkinson’s or cure this disease, we must understand the mechanism(s) (cause and story). A key to studying this human disorder (this includes most human diseases) is a suitable ‘model’. In many scientific settings, the mouse is the most-studied model to advance therapies and mechanisms for human maladies (“99% of mouse genes turn out to have analogues in humans” http://www.nature.com/nature/journal/v420/n6915/full/420509a.html ). In Parkinson’s research, a widely used model is the rat (“The rat genome contains about the same number of genes as the human and mouse genomes. Furthermore, almost all human genes known to be associated with diseases have counterparts in the rat genome and appear highly conserved through mammalian evolution, confirming that the rat is an excellent model for many areas of medical research.” https://www.genome.gov/11511308 ). We still need additional in vivo (experiments performed in a living organism) model systems of Parkinson’s. However, the current models are providing important information that contribute mechanistic answers about Parkinson’s. Of mice and men: testing hypothesis #3. 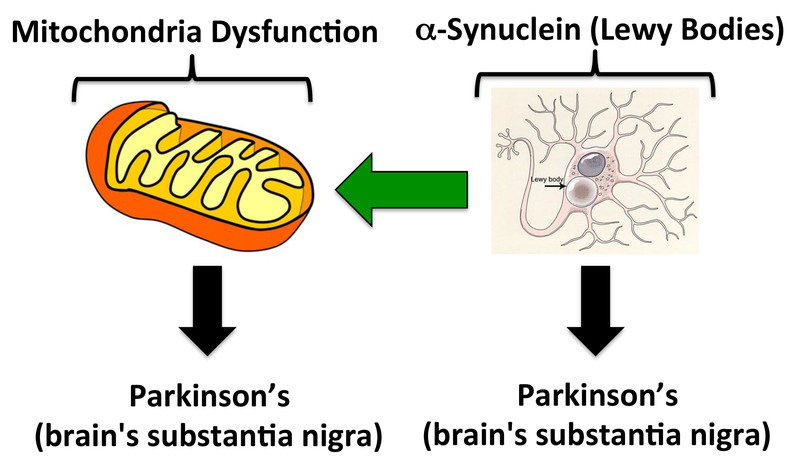 The paper by Alevtina Zharikov and others is entitled “shRNA targeting α-synuclein prevents neurodegeneration in a Parkinson’s disease model“. Citation Information: J Clin Invest. 2015. doi:10.1172/JCI64502. To view it, go here: http://www.jci.org/articles/view/64502 . Their model involves exposing rats to the pesticide rotenone, which inhibits mitochondria function. Following rotenone treatment, the animals lose dopamine-specific neurons (substantia nigra) and develop the motor-related symptoms of Parkinson’s. To test hypothesis #3, they used a gene therapy technique to ‘silence’ synthesis of alpha-synuclein (using a virus that was engineered to block gene expression). They asked does enodgenous alpha-synuclein in the brain’s substantia nigra contribute to mitochondria dysfunction following rotenone exposure that leads to Parkinson’s? The right side of the brain controls the left side of the body, and the left side of the brain controls the right side of the body. Directing the gene therapy to silence expression of alpha-synuclein in the right side of the brain’s substantia nigra showed that the left sides of rats did not become stiff and slow, while their right sides did following rotenone exposure. Furthermore, dopamine-producing neurons in the right side of the substantia nigra were protected by the gene therapy (suppressing alpha-synuclein expression) after rotenone exposure. Rats given a ‘control virus’ (not able to reduce alpha-synuclein production) developed symptoms of Parkinson’s and loss of dopamine-producing neurons following exposure to rotenone. Of mice and men: ‘does X cause Y and then lead to Z?’ How does this paper contribute to our understanding of human Parkinson’s? Please remember that science moves in incremental steps. Their results definitely incrementally advance our understanding of Parkinson’s. The next step involves the mechanism of how alpha-synuclein causes mitochondria dysfunction to promote the death of dopamine-producing neurons. Furthermore, their results provide a template to advance new pathways of genetic and environmental factors that promote Parkinson’s; ultimately (and hopefully) enabling new therapies to limit progression of this neurodegenerative disorder.